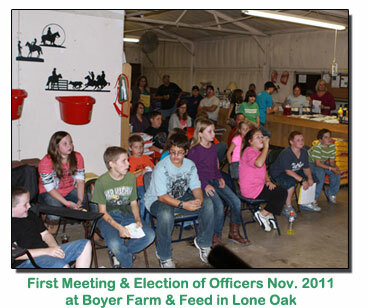 We first met at Boyer Farm and Feed in Lone Oak, TX to organize our new club in October of 2011. Over 25 people (kids and adults) attended the first meeting to show support for starting a chapter in Lone Oak. Our first officer election and training all took place rapidly during the time we held our meetings at the feed store. We proudly fly an American Flag at our meetingsthat was flown on a mission in Afghanistan. The flag was donated by the Jimenez family at our first official meeting and installation of officers. We are a diverse club with projects in all different areas including robotics, shooting sports, rabbits, textiles, cooking and various animal projects. We also host a horse project group that is open to all Hunt County Horse Project participants. 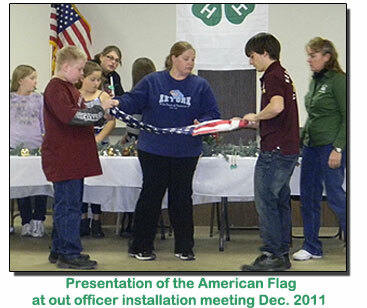 Lone Oak 4-H is open to all kids ages 8 (and in the 3rd grade) - to 18. We also have a great group of Clover Kids. Clover Kids are ages 5-8. Out Clover Kids participate in meetings and community services projects as well as other club activities. Clover Kids have special actives during our regular meeting. There are special projects in 4-H on the county level that they can participate in. 4-H gives them a chance to pursue their own interests - from photography to computers, from building rockets to raising sheep. A list of 4-H projects is available online. They go places - to camp, to state and national conferences. They learn to be leaders and active citizens.